The farm is located on the eastern end of beautiful PEI. It consists of a 40 x 100 mare barn, a 28 x 56 stallion barn, a 75 x 150 outdoor arena, and 20 acres. This is home with the horses, and two red Dobermans. The breeding goals of the farm are to produce competitive dressage horses that are amateur friendly; breeding for quality movement and top notch minds. The versatility of the mares' bloodlines offer both dressage and hunter suitable foals. 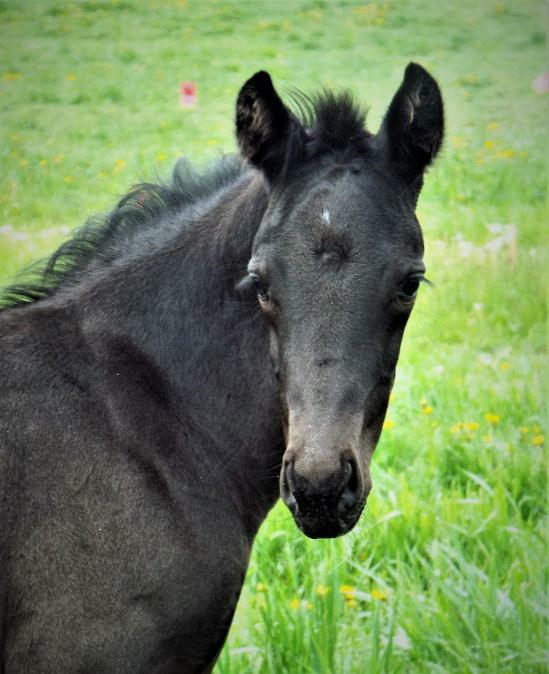 The foals are handled from day one to help create enjoyable partners for life. Being haltered, led, groomed, feet picked up, and loaded on a trailer. The young ones come to think of you as good company and are not stressed out to be away from their buddies. As two year olds they are lunged, tacked up, and leaned across. As three year olds they are ready to start their introduction to walk/trot work and are often accompanied out on the trails by an older quiet trail buddy. With this type of environment the four year olds are quite reasonable citizens ready to go in their most suitable discipline. The mares are kept out 24/7 with access to shelters, free choice haylage, and mineral licks. They are brought into stalls about a month before their foaling date, and continue to go in and out with their foals until the weather warrants leaving them out.